I am the wife of an Iraq War Veteran. In 2004 when my Marine deployed to Iraq, I had no idea what to expect and felt blindsided by the experience. When he returned (safely), I was determined to share the story of America’s Military Families and to celebrate their bravery. I used my skills as a journalist and a documentary producer to create the film While Time Stands Still. A documentary about love, courage, and sacrifice, While Time Stands Still tells the inspiring story of America's Military Families during war. In the film, I share my personal story as I follow two Military Wives before, during, and after their husbands’ combat deployments. Nearly one hundred Families of all branches, and Army experts in the fields of psychiatry, medicine, and family services were interviewed. The result is an unprecedented account of what it’s like to be Military Family during wartime. Join Kathryn Falk, Lady of Barrow, in saluting our military heroes and their families. Readers will "deploy" to a military location (themed table) hosted by authors connected to the military, including Heather Ashby, Elizabeth Boyle, Beth Ciotta, Chanel Cleeton, Emmy Curtis, Delilah Devlin, Elizabeth Essex, Lea Griffith, Sharon Hamilton, Elle James, Sabrina Jeffries, Cat Johnson, Kennedy Layne, Ophelia London, Merline Lovelace, Sally MacKenzie, Catherine Mann, Crista McHugh, Lindsay McKenna, Angel Payne, Ella Quinn, Elle J. Rossi, Susan Stoker, Julie Ann Walker, and Kimberly Rocha/Book Obsessed Chicks. Plus an Aussie Table with Megan Bamford and a Canadian Table with Julie Rowe to appreciate our Allies! Your mission includes tasting MREs, navigating the coin challenge, and singing the services' songs - The Army Goes Rolling Along", "Wild Blue Yonder", "Anchors Aweigh", "The Halls of Montezuma", and "Semper Paratus". This event is open to readers attending the RT Booklovers Convention ... plus any military families in the Dallas area. Sign up for tickets at this link. I will also have tickets available at the SOS America Promo Table in Club RT on Wednesday, May 13. Contact Kim Lowe, sos.aloha@yahoo.com, to host a table or donate door prizes. Have you tried MREs - Meals Ready to Eat? One randomly selected commenter wins a book choice from my convention stash. Comments are open through Saturday, February 21, 10 pm in Baltimore. I'll post the winner on Sunday, February 22. I will have to get more information on this DVD. I volunteer with the Red Cross in their Service To Armed Forces programs. We do not have an active duty base near here, but we do have several Reserve and Guard Units that we work with in the area. It sounds like it would be suitable for the pre-deployment briefings and family support events. We have had MREs. My husband brought some home for us to try. We could sometimes buy them at the commissary, and since the children liked them, we got them for camping and the emergency kit in the car. It does depend on which ones you get. Some are better than others. It has been a long time since we have tasted any. 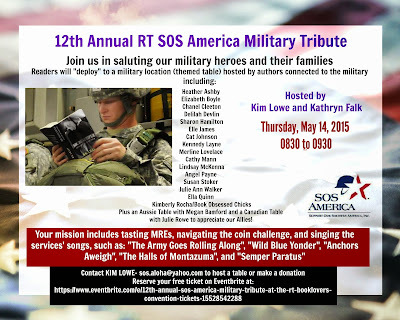 I look forward to attending the SOS America Military Tribute at the RT Booklovers' Convention. I have never tried Meals Ready to Eat. Curious though. I haven't but they sound interesting. I have never had them but my husband did when he was in the Army. Although I've seen them, I've never been tempted to try them. My dad was US Army, and Later DE Nat Guard. He brought home C-rations, and later MREs for us to eat (as a treat). lol. As kids, we **thought** it was a treat. I hope they taste better now. I should as my brother--he was in the military late 90s/early 2000s. He works at military base(s) as a civilian. I still have my military can opener Dad gave each of us. On my key chain. Post-Hurricane Ike, when we were without power, our community had MREs distributed to us on an emergency basis. We were surprised and pleased to note that there were even some vegetarian meals included! I have eaten a MRE ... and liked it. I'm looking forward to seeing more about this documentary. Your event sounds like it will be lots of fun! Yes, a long time ago and I have to assume they are different and hopefully better now lol. Yes, a guy who used to live next to us had a huge box of them and when he moved out he didn't want to take them with him so he asked hubby if he wanted them. While some were ok others were kinda nasty but for the most part all of them were alright. Yes - during Hurricane Sandy, when our town electric was badly knocked out they were handing them out at the Police Department - they weren't bad, but I wouldn't want to eat them for very many days - really makes you appreciate fresh cooked hot food! I have had an MRE. While stationed at Gulfport MS we were evacuated to the huge warehouses that were used by SeaBee Battalions for heavy equipment storage from Military Housing because of a Hurricane. We slept in a truck bed. Of course we had babies then and brought food, water but my oldest then 3 had to have an MRE I can say they are much improved now! Kim I look forward to meeting you in May at RT!